A few weeks ago I was washing our old couch pillows (which I had done several times before) and one of them came out of the dryer with a huge rip in it - bummer! It was kind of alright though because I had bought them right when we first got married and my taste has shifted a little since then so it was nice to have an excuse to replace them. Here's the problem though - I'm super picky and super cheap. Not a great combo since apparently nice pillows are like a thousand dollars a piece (just kidding! Although I wouldn't be surprised if there are some out there that expensive). So it was time to get a little crafty. And since I've been working up to making a quilt I thought it was a perfect excuse to practice some (very) basic quilting to make my own pillows. 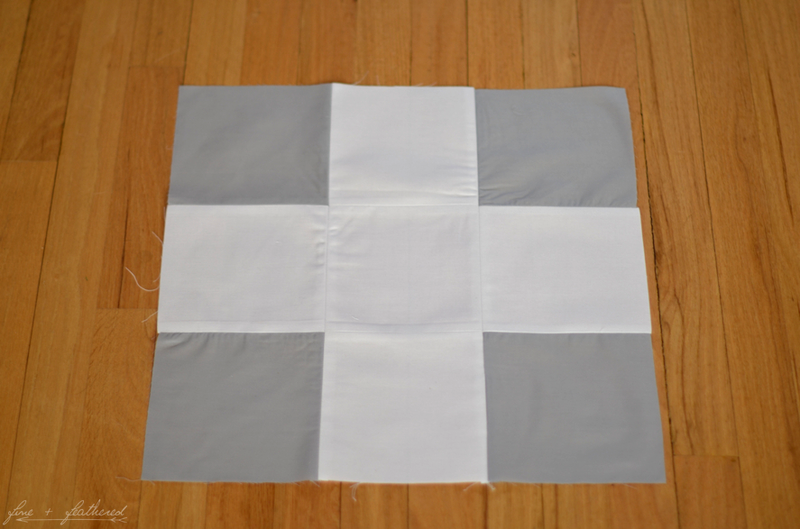 To start I cut out 9 squares - 5 white and 4 gray (you could interchange for any colors). Each of my squares were 6.5 inches which ends up making about an 18inch pillow. 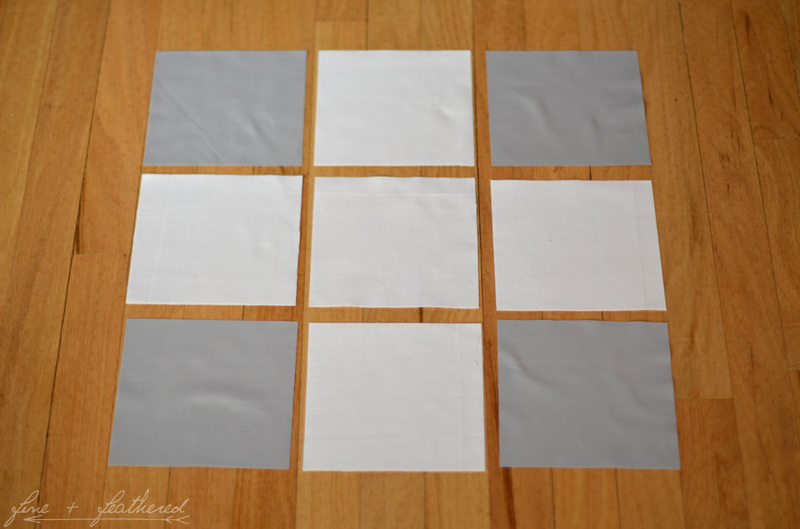 Lay them out in rows of 3 each - the top and bottom row will be gray/white/gray and the middle will be all white. Sew each row together with a 1/4 inch seam allowance, ironing the seams open as you go. Sew all of the rows together (1/4 seam allowance). Then you can decide what you'd like to do for the back. Our old pillows were in such bad shape anyway that I decided to take them apart and use the old stuffing to stuff these ones and finish them off as regular pillows. For this you can just cut one peice of fabric the same size as the finished front piece (mine 18x18). Put the right sides together, sew up 3 sides and 1/2 of the last side. 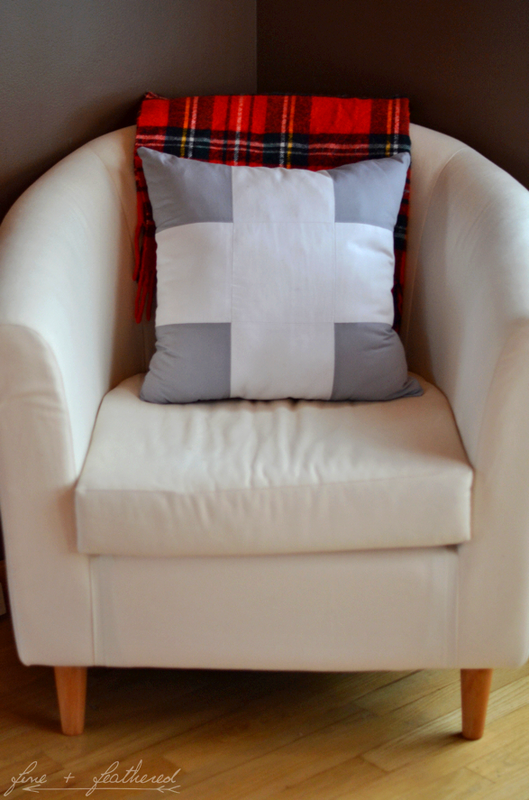 Turn the pillowcase right side out, stuff it, and you can hand sew up the last little bit! You could also just make it into a pillow case too. There are several good tutorials out there if you want to go this route - This one from Martha Stewart give directions for a button closure, just skip the first step. There are several different types of closures for pillow cases you could finish it into and LOTS of tutorials online for every kind. I'm pretty in love with it! I really love the colors, although I'd love to make some smaller ones in the future maybe in red and white!